I love jeans. So, most of the time I wear a denim pant rather than formal/casual trousers. It is not only me. Many individuals, especially the young generations (man, woman, boys, and girls) love wearing jeans. After the t-shirt, I think possibly jeans is the second top popular item among the variety of apparel products. You might be thinking - why I am sharing it today? I have been asked the following question. Before listing the machine types I am trying to introduce the popularity of jeans and its market demand. QUESTION: I am planning on starting a small level business of jeans manufacturing but I don't have any knowledge about the machinery required to make a good jean (denim pant). Please help me to know about the machinery required and what would be the cost of those machines. Let me reply to the question asked by one of my fans. 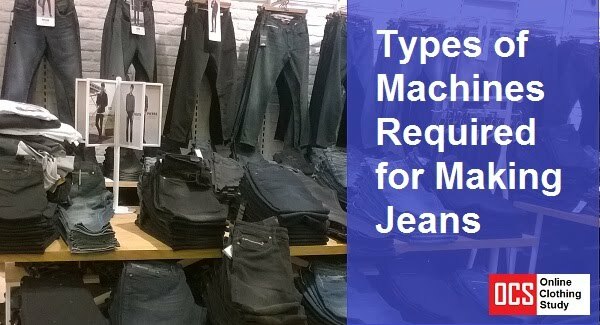 I have listed different types of machines required for making jeans in a factory environment. You can also install denim washing unit and special finishing set up. For machine models and brands, you can refer this page. To identify operation specific machines and estimated operation time read this article. Machine types and machine models remain same. But machine prices are variable depending on the brand, country and order quantity. I would suggest you contact a machine supplier/agent in your location and collect machine price list. A price quote from multiple machine suppliers will give a better idea of machine prices. You can estimate capital investment on machines from the best price quotation. Are you interested in setting up jeans manufacturing unit? Read this post to learn different types machinery requirement.